National DSA field organizers Ryan Mosgrove and Hannah Allison and National Director Maria Svart came to Atlanta together with NPC member Allie Cohn (Knoxville) and other volunteer activists from the Southeast to conduct a very inspiring leadership training held at Ga. Tech July 14-15. Ryan posted that “comrades from 10 chapters in 7 states came together for our first southern regional gathering since the Canton rally in 2017. 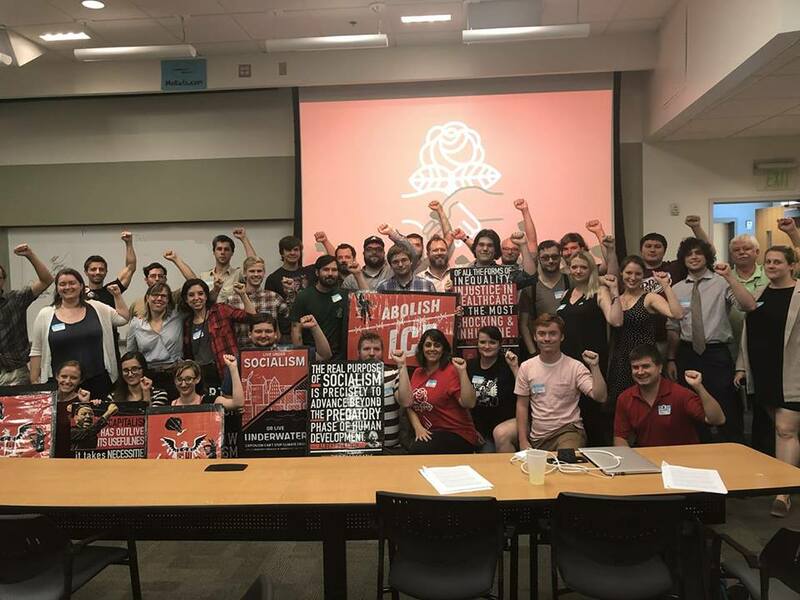 Huge shoutout to the MADSA comrades for hosting and all the comrades who came out and made this amazing event happen.” About half of the c. 40 participants were from MADSA and Georgia Tech YDSA. They heard presentations and discussed ways to strengthen chapter organization and member engagement and development; campaign planning; the three national priorities (Medicare for All, labor, and electoral work); and anti-fascist organizing. A highlight was a very informative and moving panel of organizers from Atlanta’s Housing Justice League. MADSA members are urged to attend their July 18 action at the Forest Homes HUD apartment complex in Thomasville. Everyone who attended came away determined to apply what they had learned to strengthen our movement in the Southeast. Y’allidarity!